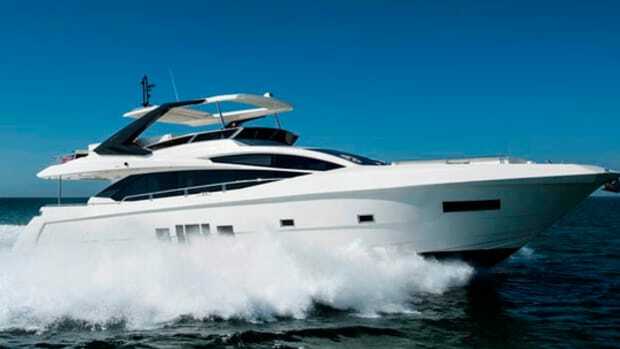 Serious yachtsmen will be smitten with the Absolute 72 Fly’s ride and performance. Oh yeah, the interior is tough to beat too. I have a proposal that I’d like to present to the sales folks at Absolute. Just hear me out on this. If a budding customer is willing, I suggest that they are blindfolded before getting too close to the 72 Fly. Then a guiding hand escorts them to the upper helm. A captain with the gift of sight maneuvers the 72 to open water. Once they are seated behind the wheel—preferably while cruising at 24 knots—the blindfold is discarded. Then it’s all over! 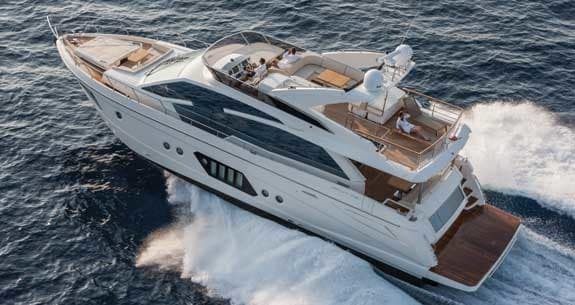 All of the other highlights of the 72 Fly—a stylish, semi-custom interior, megayacht-sized flying bridge, wide teak side decks, and high-end equipment—are just background noise that will divert attention from the main event: Taking this baby for a ride. Power is from twin 900-horsepower, 13-liter, dual-turbo Volvo Penta D13s joined to IPS1200s. 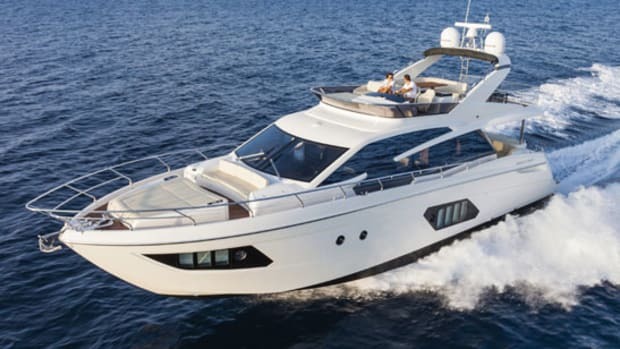 This third generation of IPS allows builders to achieve performance targets on larger boats without installing three engines. My issue with triples is that I simply prefer maintaining two engines versus three given the choice. Moreover, I’ve yet to find an engine room housing a triple install that has satisfactory space around all sides of all three engines. 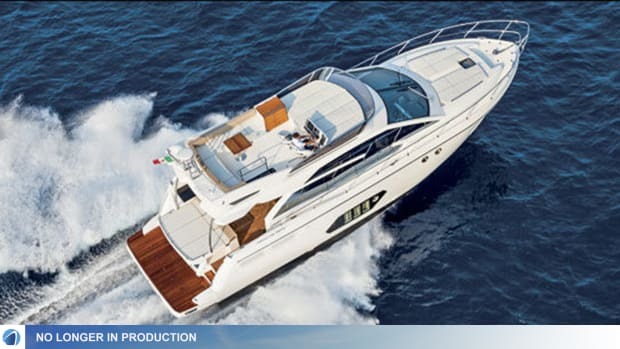 Italian boatbuilder Absolute was an IPS pioneer and began installing the pod system in 2006 on its 56. Keep in mind this was only a year after Volvo Penta introduced IPS to the recreational boating community. “This early and strong relationship has really produced dividends,” said Cos Conostantinou, president and CEO of Absolute North America. I soon realized what he was talking about. I’ve driven a number of pod boats and usually expect to apply a little trim tab to bring the bow down while getting over the “hump” and onto plane. “Hey George, you don’t need to use those,” said Conostantinou, in a soft, professorial tone, noticing my right hand automatically stretching towards the Bennett tab switch. And man was he right. The 72 Fly maintained a near linear running angle from 900 rpm throughout the speed curve. At wide-open throttle we ran at an angle of approximately five degrees. During the test run, I simply applied more throttle, and the running attitude barely changed; she simply went faster. The combination of smart hull design and the low-end torque of the Volvo D13s certainly contribute to this smooth acceleration curve and optimum running attitude. Furthermore, throughout the sea trial there was no sign of smoke or wallowing, no matter how hard and quickly I pushed the throttles. Granted our boat was not equipped with the optional hardtop, tender, and owner’s gear, so speeds will obviously be affected slightly after commissioning. The 72 responded to fingertip adjustments of the wheel. When I put the helm hard over at 30 knots, we barely shed any speed, dropping only to 27.5 knots while in the turn. She responded through a series of “S” turns with doses of smaller sport-boat peppiness, yet with the stiffness of a larger yacht. There was zero tendency to chine walk or bank excessively. “Great driving boat, huh?” asked Conostantinou rhetorically, as we galloped at 30 knots toward the Cannes harbor entrance. I believe my crooked smile gave him the answer he was expecting. Driving the 72 pushed to the pins, however, is not really what this boat is all about in my opinion. 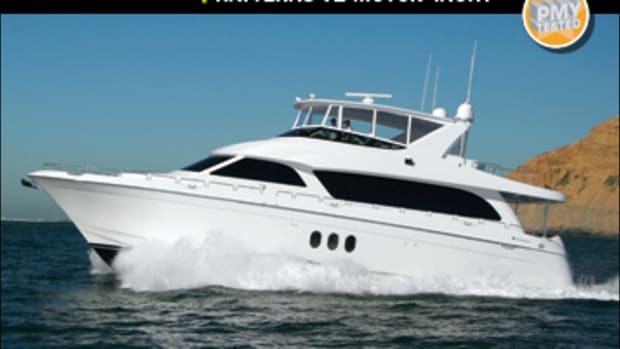 Pull her back to 2100 rpm and she settles into a cruising speed of 24.5 knots burning 65 gallons an hour total. Again, the tabs were never adjusted during any of this run and a comfortable running attitude below 20 knots continued. Let’s not forget that at the end of the day, sea states and conditions won’t always allow you to blaze a trail as you head off at top speed to your next destination. This attention to construction, engineering, and details at Absolute, runs through the bloodstreams of the father-and-daughter management team of Angelo and Patrizia Gobbi. 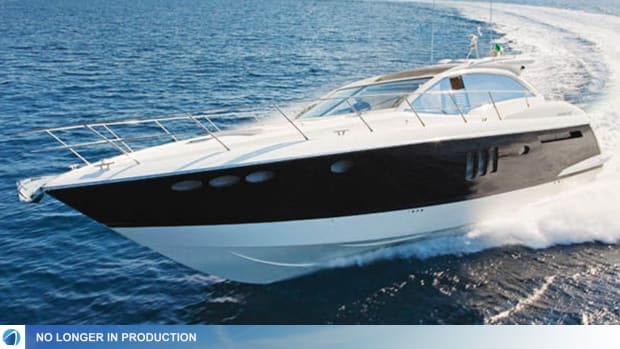 The duo joined founders Sergio Maggi and Marcello Be after selling Gobbi Yachts to Azimut-Benetti in 2001. 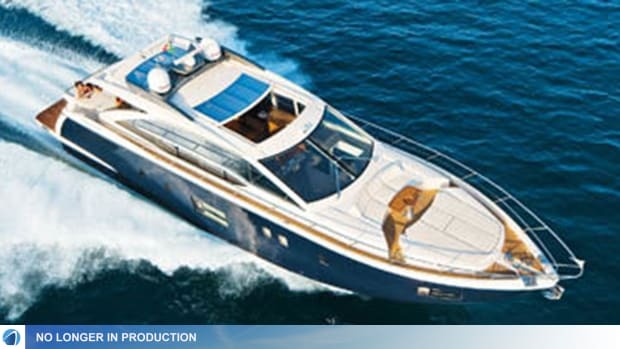 Today, the Absolute series ranges from 40 feet to 72 feet in express, sport, and flying-bridge versions. 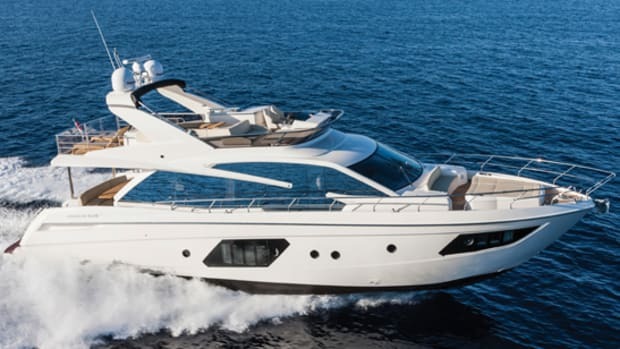 In Conostantinou—a marine professional with an impressive project-development and sales career with builders such as Azimut, Sea Ray, and Cobalt—the Gobbis have found a passionate boatbuilder who understands the serious boater on this side of the Atlantic. Believe me, this is key. I don’t know of any builder thus far that has successfully served up the exact same boat in European and American markets. “We wanted to wait until we had the right product and dealer network before we began rushing product into the States,” said Conostantinou, revealing his quiet, yet persistent, quest for perfection. Absolutes are now beginning to trickle into the Americas. The end-user benefits from customer support during and after the delivery, even beyond the dealer level if necessary. Conostantinou and his team inspect each model twice during construction, and then sea trial the boat in Italy before shipping. 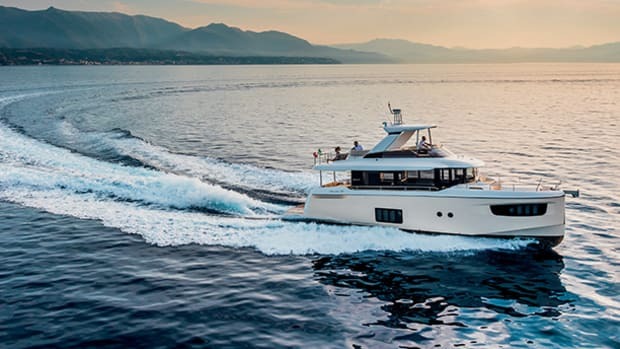 During my test in France, Chad Hofer, Absolute North America’s director of sales and marketing was just returning from sea trialing a new 64 bound for the U.S.
On the larger models, the builder is fairly flexible and willing to incorporate the owner’s input as long as the integrity of the boat is not compromised. 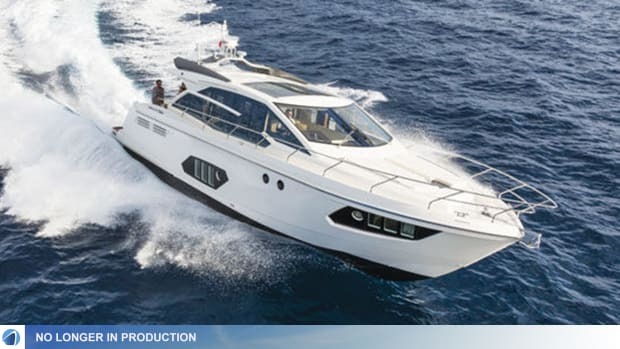 “We even go with white engines and engine rooms for the boats I order,” said Conostantinou, alluding to the fact that North American buyers may spend more time in the engine room and get more excited about the mechanicals than some European boaters. Access to the engine room is through either the crew quarters or a cockpit ladder. There is more than sufficient space all around each engine for service, even with the two outboard fuel tanks. I would like to see the dual fuel filters in a more accessible spot to allow for easier, and perhaps less messy service. Currently they are above the respective fuel tanks and will be a little awkward to access. All wiring runs and plumbing were neat and beefy. What about the aforementioned background noise that tends to emanate (if even faintly) from elements such as the stylish, built-to-suit interior? Well, it could almost be forgiven if the execution was so-so but overcome by the 72’s excellent ride. But it’s far, far from so-so. Although the owner’s input is welcome, it will be tough to improve upon the space planning and quality of the saloon of our test boat. 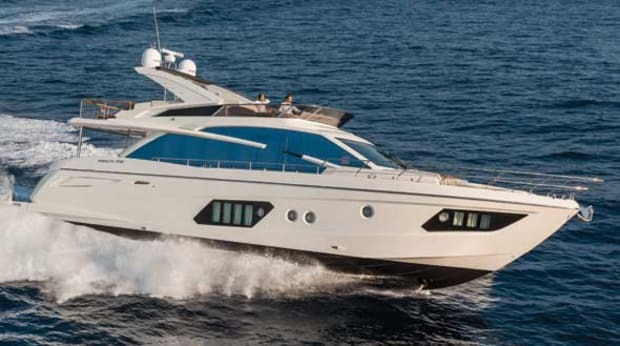 The one-level area seamlessly joins the large aft deck and flows past two leather sofas, into an honest-to-goodness dining area, flanked by the galley, and terminates at the lower helm. A side door on the starboard side allows the captain to pop outside and help with docking if cruising shorthanded. If this were my boat, I would forego any temptation to alter one of the lower staterooms into an onboard office and would set up shop with my laptop on the elevated settee to port of the lower helm. The line of sight from the lower helm, even while executing some of the hard-turn maneuvers, is good and unobstructed. For docking ease, there is a remote IPS joystick in the cockpit. The full-beam master feels more like a beachfront suite in St. Barths. Waking up here with a view of a secluded cove and clear water will surely wash all your stress and troubles away with one simple glance outside. Two additional staterooms are amidships and the huge VIP is tucked in the bow. I applaud Absolute for making an effort to eliminate sharp angles in the joinery and furniture. Anything at adult kidney level or a young kid’s eye level carries a slight radius. (Next time you’re walking through a new boat at a show, check out how many sharp angles are incorporated into furniture. It’s crazy.) There are still a few areas where function could probably trump form with the addition of a fiddle and grab rails here and there, especially in the shower stalls. However, when considering the 72’s thoroughbred riding characteristics, top-notch build, and the builder’s semi-custom approach, it’s easy to turn a blind eye to the fact that the shampoo may end up on the floor while sprinting to the next destination. I have no doubt this 72 footer will surely open a lot of eyes on this side of the Atlantic. 600 gal. fuel, 200 gal. water, 8 persons.